After a foreigner obtains a residence permit (permesso di soggiorno issued for a specified period) or permanent residency (carta di soggiorno without a date of expiry) in Italy, he/she should apply to the Revenue Agency of the Italian Ministry of Finance for fiscal number. But this process is quite long in Italy, and entrenched bureaucracy will have to be faced which will require significant effort of the applicant. 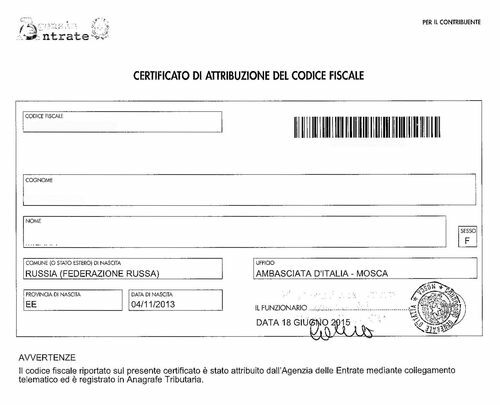 However, this can be seen about in advance, and “codice fiscale” can be obtained in Russia at the Italian Embassy in Moscow. 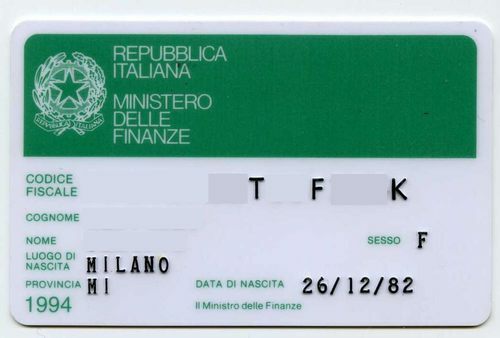 The difference between documents issued by the Italian Ministry of Finance and documents issued by the Italian Embassy in Moscow is only in their formats – Italy issues a plastic card, and the Embassy issues a paper document. We can make it much easier for you and obtain “codice fiscale” on your behalf. It requires a power of attorney issued in our employee’s name, which power of attorney is executed in simple written form (a sample thereof can be sent to you upon request), and a copy of an applicant’s passport for traveling abroad (an international passport). The cost of our services is RUB 3,000.00, and the time limit is 2-3 business days.